Howard Danzig, president of Employers Committed to Control Health Insurance Costs, or ECCHIC, a St. Louis-based company, speaks Wednesday to local business owners during a luncheon at Delmonicos in Jackson. Howard Danzig, president of Employers Committed to Control Health Insurance Costs, or ECCHIC, a St. Louis-based company, says employers are up against high costs in providing health insurance to their employees, and to address it, employers should consider breaking up insurance costs to get to the cost per unit. Danzig said the health-insurance industry started to shift from a cost-indemnity model to a PPO, or preferred provider organization, model in the mid-1980s. 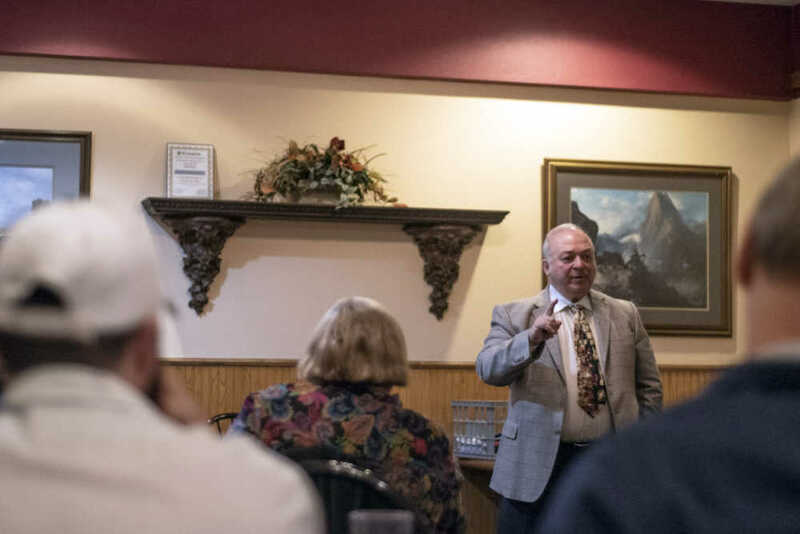 That added middlemen, and added cost, he said, addressing a workshop group alongside Steve Horst of Horst Pharmacy on Wednesday at Delmonicos in Jackson. Pharmacy costs make up one of four categories bundled together under a typical health insurance policy, Danzig said, the other three being administrative costs, catastrophic insurance and basic health care, such as checkups or other routine medical expenses. And the cost of pharmacy coverage is the fastest-growing segment, Danzig said. That’s bad news for employers, who can face rising premiums and lowered benefits in today’s market. Many employers wind up premium-shopping, Danzig said, when they should be doing a detailed analysis of the actual costs associated with policies. But many insurance companies won’t release itemizations, Danzig said. That, coupled with big-name mergers, winds up being bad for the consumer, Danzig said. His company offers to eliminate middlemen and work directly with local providers and pharmacies, he said. The Cape Girardeau Career and Technology Center is seeking business and industry representatives to assist with mock interviews at Student Professional Development Day on March 29. Morning and afternoon sessions are available. For more information, contact Rebecca Peters at petersrj@capetigers.com or (573) 334-0826. The Cape Girardeau Area Chamber of Commerce recently announced Kendra Elaine, Millennial Leadership Expert, will be the keynote speaker for the Emerge Young Professionals Summit on April 26. The second annual summit is a one-day experience providing a space for young professionals to get informed and become inspired. In addition to the keynote speaker, panel discussions, motivating change-maker sessions and opportunities to connect will be available. Questions may be directed to Dana Brune or Taylor Laws at the chamber, (573) 335-3312 or capechamber.com. Dogwood Social House will hold a ribbon cutting at 3 p.m. today at 80 S. Plaza Way in Cape Girardeau to celebrate a grand opening. Jeromy Fritz applied for a business license to operate Presort Inc., a mailing and advertising business, at 2121 Bessie St. in Cape Girardeau. Business open date listed was Feb. 15. The Missouri Veterans Home in Cape Girardeau recently announced Holly Lovel has been promoted to personnel analyst I, effective Feb. 1. Lovel has been a member of the Missouri Veterans Home team since November 1998. She began her career as the front desk receptionist and was promoted to administrator secretary. In 2001, Holly was promoted to clerk stenographer III and in 2003 was given the position of personnel clerk, where she has worked as part of the Human Resource Department for 15 years. During her tenure, Holly has been instrumental in the training of other human resource staff at the other six homes in the state. She was appointed to run the time keeping interface for all seven homes before the current system and is called on to help answer staff questions from other veterans homes regularly. Recruiters Websites, a Cape Girardeau-based web design and development company, has named Matt McKenzie its web design and experience manager. In this role, he will lead the website project team, contributing insight, expertise and best practices to design, develop, manage and strategize clients’ optimal digital experience. McKenzie joined Recruiters Websites in 2014 as a web designer/front-end developer. He came from Canedy Signs & Graphics. A Jackson High School graduate, he earned his associate degree in applied science in computer technology from Southeast Missouri State University. He is a three-year member of the Cape Jaycees. Got a Person on the Move at your business? Submit online at www.semissourian.com/forms/peopleonthemove.